PetanqueShop rewards your loyalty ! How does the PetanqueShop loyalty program work ? It's simple : € 1 spent = 1 point earned = € 0,05 voucher. Collect points as you place orders (there is no time limit), and redeem them for a voucher, whenever you want. Example: I order a triplette Obut RCC for € 190, I get 190 points of fidelity, or € 9,50 in voucher (for a next order). Your triplet returns to 180,50 €. How to redeem your loyalty points ? 1. 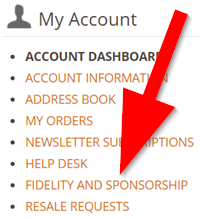 In your customer account, click on "Fidelity and Sponsorship" in the left menu. 2 . In the section "Balance of your points", you will find the total of your points (fidelity and sponsorship). 3. Click on "Exchange my points in voucher". 4. Enter the number of points or the euro value (€) you wish to use. The amount of the other value is updated according to. You do not have to use all your points at once. 5. Click on "Validate", and make sure that a green box appears, confirming your request. 6. An e-mail is sent to you within a few minutes, with a 22-digit code in the format XXXXX-XXXXXXXXXXXXXXXXX. How to use your loyalty voucher ? 2. When validating your new order, fill it in the "Discount Codes" box. 3. Click on "Apply coupon" to deduct the voucher from your cart. Refer your friends and win € 5 ! How does the PetanqueShop referral program work ? It's simple, 1 sponsored godchild = € 5 voucher. Your sponsorship is validated once your godchild has made its first order. 1. In your customer account, click on "Fidelity and sponsorship", in the menu on the left. 2 . In the "Sponsorship" section, click on "Sponsoring my friends"
6 . Click on "Send email"
Points are calculated from the amount excl. tax of the products, so that our foreign customers can benefit from this program. However, your voucher will be applied to your order include tax. Find more details in our Terms and conditions.